I'd love to give one to you. Why? First, because I appreciate you and all that you've offered in the past - friendship, a shoulder, encouragement. Second, because I quietly wrote my 1000th post last week and it's my way of celebrating. How to drop your name in the hat? 1. Content: What do you like/not like about this blog? What's your favorite feature? Least favorite? Are you here for the bags? the sketches? What would you like to see more of? 2. Design: How about the new design sans top banner? Is this blog easy or difficult to navigate? 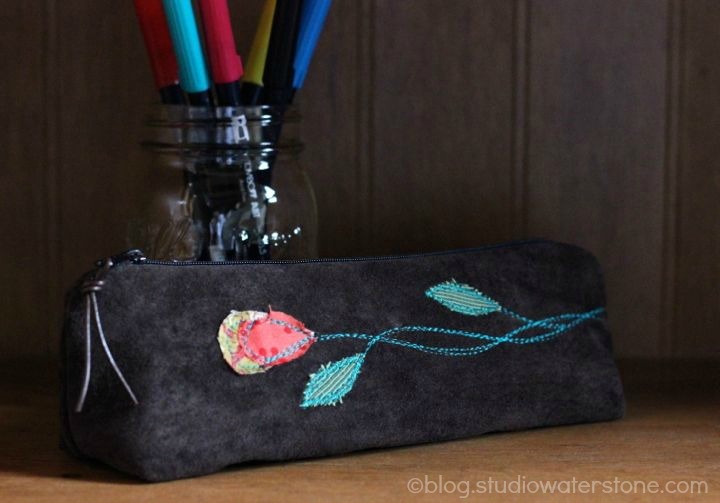 Oh, and that will enter you to win the suede Artist's Pouch. You have through this Wednesday, October 31st, midnight. I'll announce the winner on Thursday. Open to the US. Winner will be randomly selected. P.S. To my friends along the east coast preparing for Frankenstorm - my thoughts and prayers are with you. Hold tight! Stay dry! Be Safe! Wow...1,000 posts! congratulations! personally, I like the bag for several reasons 1). Size-it's compact and would not take up tons of space inside my purse. 2). SUEDE! Love the suede. 3). The punch of added color makes it unique and truly one-of-a-kind. 4). It's handmade BUT it dosen't "look" handmde...know what I mean?! it is beautiful, and you are so generous! I love the photos on your blog and your postings are short and sweet, sometimes if I see a super long post I will move on until I have time later. I love your tutorials even if I can't get to them at this point in time. I really don't have least favorite feature. I think your blog is one of the easier ones to navigate, I don't have to search for the shop button. I am mostly here for the bags, you know how much I love your pouches. I have started carrying a larger bag and I use the pouches to get quick access to what I need. I would like to see you using your sewing skills for different accessories, I love the infinity scarves. I would also like to see some paintings of more than quotes. I'm here for the bags, honestly. I love reading about your progress and working out issues. I think your site is very easy to navigate! I came across your blog when you did the book tour with Barbara Lewis and have loved following you ever since. I love your bags and one day I will get to one of your colored tapestry and leather bags(like the one on your bags button). I also really like the Tall Artists Pouches, they would be perfect for tools. I think your art work is so cheery and I really enjoy when you post it. I am very inspired by your photography. I would just have to say I am inspired by your blog period, and I find nothing difficult about navigating your site. First of all, congratulations to your 1000th post! I hope you treated yourself with some champagne to celebrate. I already wrote that I love the new site design, and it's easy to navigate. I'm here on a regular basis for the sketches and your beautiful photos. I love your bags, too, so in the end I love your blog the way it is! I enjoy both the bags and the sketches. I think I would not be here, however, without the sketches. I told you that I placed your blog in the color category in my feeder. Navigating is fine and I like the bannerless blog. I would, however, wonder how that works for a first time viewer since the banner gives us hints of what to expect. 1000 posts, what an accomplishment. Congratulations. I do miss the banner - but that may just be because I love looking at your work. Love, love your bags! Congrats! I love reading your blog, what brought me here was the bags. I like the photos, the simplicity and your sense of humor. I always love your banners because I love the pics so I kinda miss it. I love your sketches!I would love to buy a bag but can't afford it now. I like your designs of your bags. Congrats on 1000. Also an ATL & former Cincy resident. I think I come to your blog for the creativity. It doesn't matter to me what you're doing, I like the fact that you do it with all of your heart and in a way that seems accessible to us with no sewing skills at all! For me, your blog is super easy to navigate and I know that for a while you were working with others on their blogs and I can tell you, I can spot your online work as well. Very user-friendly. Keep up the beauty! You're bags are what first drew me to your blog but I love your blog for the sketches, the friendship you offer through sharing your life with us and the sketches too,, I always look forward to the new sketches and new bags/pouches etc that you create. I have no problem finding my way around your blog.. very easy to do,, but I kinda miss the banner at the top. Have a great week! Congrats on the 1000th! I love your artist's bags. 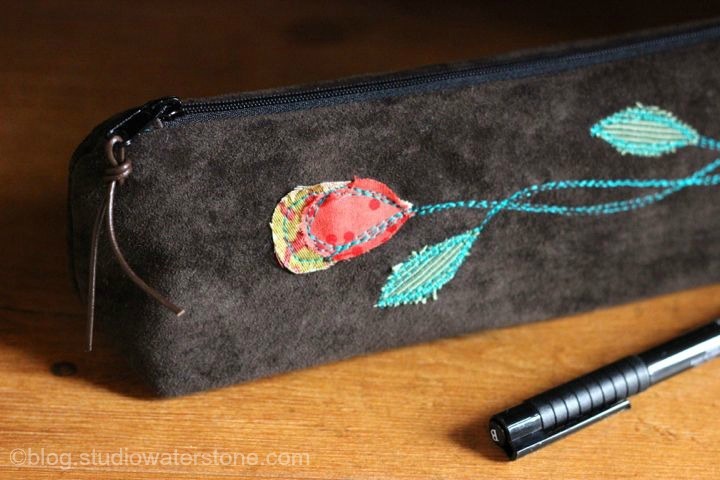 I love the suede on that particular one and the rose applique. It's simple and unique and perfect. I love to see your new bags, sketches and photography. I don't always comment, but yours is one of my favorite blogs to read. I usually read your blog via reader, so I hadn't noticed the loss of the banner. I like the new look, though. I don't need to scroll down to see the blog post. Honestly, I think I like the new design better than the previous ones. Initially, I came to your site due to the bags...btw I love the suede for a supplies bag because I live where it rains a lot and suede is best for an "inside" bag. In general - yours bags are so appealing - organizationally and aesthetically, structured but with a flourish. Now I also enjoy your drawings SO much - and because you are a Macro Girl - I particularly like all the shots that let us enjoy the detail up close. Your site is easy to navigate and I really like how clean and bright it is! It's funny, I found your blog by some crazy links and it is one of the few that I look forward to every day. I love your pictures and the whole Macro thing...and as for your content on the bags and sketches, I love seeing them both. As for removing your top banner, I love it...less scrolling to get to the good stuff. I find it quite unconventional and unique. Might take a page and try it on my blog....! As to your giveaway, I would love to have the pouch...it just looks like it would feel good in the hand. As to these pouches, also a question and that is have you ever considered one that would hold the 25 or so Zentangle pens and the 4X4 paper squares for on the go tanglers? I've had a time trying to find the right size container that is not a hard plastic pencil case...Just a thought. Keep on creating, it is a joy to watch the transformation! I love your bags and seeing peeks into your creative process but I really just enjoy your writing and lovely photographs, whether they are of bags or artwork or your pup! I liked your banners but I don't dislike the new layout either. Not a lot of help, am I? Content: My favorite blog posts are ones that involve Sophie in some way...always makes me smile :) I like seeing your artwork and bags. Your photography is amazing, but I have never been a big fan of Macro Monday posts on people's blogs. Maybe if I participated I would like it more. I would rather get to the crafty stuff or recipes...love when you share recipes! Design: At first I didn't think I liked the banner-less look, but then I realized I do. It's clean and fresh looking. My blog needs a SERIOUS makeover...wonder when I will ever find time for that! Your blog is very easy to navigate, and I love that! Hope this helps and thanks for the giveaway!! first of all congratulations on reaching 1000 posts, that is amazing! secondly, I love your blog, I love the visual impact of the photos, I enjoy the content! And I really love the bags you make! 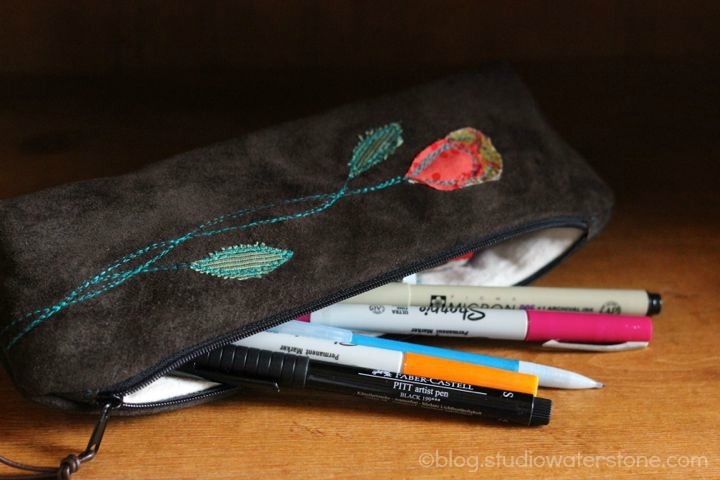 It would be an honor to win your artists pouch, it is gorgeous! Congrats on 1000 posts! That's a lot of posting! I found you through Barbara Lewis' book tour, and became a follower instantly. Your bags are very cool, and I'd love to own one some day. Your sketching is so beautiful. I wish I could sketch like that. I think it's awesome that you'll be selling prints of some of them. I love the photography on your blog (and love your dog!). I read your blog through google reader, so your blog layout and ease of use doesn't affect me, unless I leave a comment (like now). I'm mostly a lurker! I like the cleanliness of your blog, now that I'm here. I don't think you need a banner. And, some blog banners are an entire page high and take forever to load, so I'd prefer no banner. Congrats on the 1000 post!!! What a milestone to achieve. What can I say about your bags? I love them. Your artist pouch is especially cute. I would use it as such. But I like the idea someone else mentioned about sizing some for zentangles. I especially like the flat bottom on them. That way they sit up and your stuff won't fall out. Your bags are why I originally came here, but I must confess, I come back every day just to visit you! I enjoy blogs that share a bit of personal along with the business side of life. When someone shows enough of their personality, a blog visit is like stopping to chat with a friend. At first, I didn't care for the no banner across the top. I must say though, it is growing on me. I enjoy the variety of content on your blog. I think that you have a healthy mix of your personal life, sketching, in progress bags, general inspiration, etc. The new layout is really nice. It's simple and easy to use. I must say-before I added my comment - I reviewed a bit & got wonderfully lost in old posts. That little trip validated my "at first thought" comments. I really like it ALL. I love the stories; the photos; the dog; the sketches - so love the sketches. The bags - not only do I love the bags, but the ideas of what to put in the bags! I'm a big "bags inside of a bag" kinda gal - so any idea of something else to add to a little bag to put in a big bag - I love it. Oh - from a technical perspective - I love the side banner! 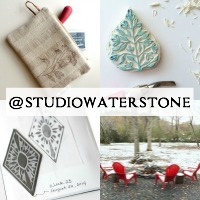 That way the first thing I see is your post & that wonderful sketch of your shop name! I do love your sketches & am thinking that a sketch of yours on weathered wood - with my house numbers surrounded by lots swirly garden goodness! What a way to have visitors find our house! If you ever decide to branch out - I think house number signs for those of us living in the woods would be lovely! Thanks for writing; sewing; sketching & sharing. Thanks for opportunity of the bag – wonderful gift! Congrats on your 1000th post! I love the blog. I come for the bags. The pictures are really nice to just look at - high quality! The color combos get me inspired. I'd love to win the beautiful bag. Congratulations on your 1000th post. I don't know how I found your blog, but I love it. I just drool over each of your suede bags. Love the size and everything about each one of them. Your blog is easy to navigate. Also love the sketches. Colors are wonderful and I love that I can get so much inspiration (from the bags and the sketches) Not a big fan of the macro but I know that others do and sometimes I have to remember that everything isn't all about me. Thank you for all the effort and love you put into your blog. I love to see your posts... your sketches are my very favorite part!!! Love your style and creations!! Your new look is clean, fresh and uncluttered. Congrats on 1000 posts! I am looking forward to much more inspiration from you! You are so talented with your artwork and bags. I am inspired by your work. You have interesting photos and it's fun to read. I am also a dog person and it's great to see your sweet Sophie. 1000 posts! Good for you! Keep 'em coming. Site is very navigable .. wider than most but that is ok then I have a chance to use my scroll over bar. .... all in all A+++ ... and Mucho Congratulationo!!! Well I have nothing bad to say about your blog! I love everything. Your bags are beautiful, you're an incredibly talented artist, I love hearing about your pets and what inspires you. You're great a blogging! I think it's easier to navigate with everything at the side, I like it! I discovered you a couple years ago from one of your bag tutes, and have loved you ever since! When i need inspiration or a break from my crazy life i check in and see what you have been up to! To be honest I usually use Google Reader and then pop over if i have time, that said, I do like the new layout! You are so good about making everything easy to find! 1000 posts - congrats! I love your bags,...have two of your clutch handbags and would love one of the little ones for pens, make up, jewelry tools, etc. I like your blog because you share a wide range of topics, you can be serious, humorous, all that stuff. You give out good tips, etc. and your photos are to die for!! Hi Lori! You blog is one of my very favorite! I love everything about it! I love your writing and great sense of humor. Your artwork is absolutely beautiful! And, your bags and clutches -- someday I'll splurge so I can own one! I don't think you need to change a thing -- your blog is perfect just the way it is!